The Maroondah Aqueduct was built in 1886 and 1891 to take water from the Watts River to Preston Reservoir. This ride is a loop from Eltham that includes a decommissioned section of the aqueduct at Research. The initial part of this ride goes along the railway and alongside Main Road Eltham to Research. The track alongside this busy road undulates its way upwards to the real start of the ride - the Maroondah aqueduct. This disused channel provides a scenic ride along a ridge with excellent views across to Doncaster and towards Kinglake. Next is a major descent down to the train line. This very steep downhill section will give you quite an adrenalin rush. Of course, as it is just a short section of path, walking down is an option if steep descents are not your thing. The rest of the ride to Diamond Creek is on the trail through bush and parklands and has a pleasant rural feel to it. 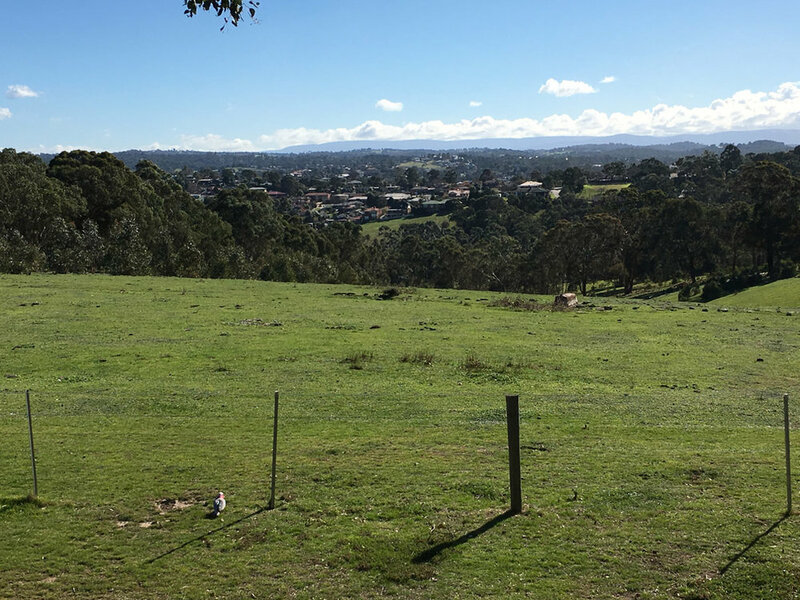 The return ride to Eltham is back on the trail, which passes by Edendale Community Environmental Centre. There are cafes at Eltham near the start and end of the ride and at Diamond Creek near the turn around point. There is a café and toilets at Edendale Farm Community Environmental Centre where there is a farm and café. There are toilets at Eltham Station and at Diamond Creek. The ride is mainly flat with one long steady uphill section and a steep downhill swoop. It is on sealed bike trails. The ride starts on the eastern side of Eltham Station. Head north along the shared footpath next to Main Road. Turn left 150m after Diamond Street to cross the railway line. Turn right to stay on the bike trail keeping Railway Parade to your left. Cross Wattletree Road by crossing Railway Parade and using the underpass. Immediately cross Railway Parade again and cross the railway line. Follow the uphill bike trail to your left. This will turn to the right and go via Coleman Crescent to Main Road, Eltham. Take the bike trail along Main Road keeping the road to your right. Ignore the bike trail signs pointing up Ingrams Road and continue along the footpath in Main Road until you pass Research Primary School. Take the service road to the left that goes past Eltham Little Theatre. At the end of this service road you will find Aqueduct Trail. Turn left on Aqueduct Trail and follow it crossing Ingrams Road and Allendale Road. At Goober Road, turn left to return to Allendale Road. Turn right onto the path next to Allendale Road. The road will be on your left. Ride down the very steep hill and cross the railway line. If there is light traffic, it may be easier to ride down the road rather than down the bike path which is a bit rough and may have debris on it. You will intersect with Diamond Creek Trail just after you cross the railway line. Turn right and follow Diamond Creek Trail to Main Road Diamond Creek. Turn around and retrace your steps to Allendale Road. Cross Allendale Road to continue on Diamond Creek Trail with the railway line on your left. Follow Diamond Creek Trail all the way to Wattle Tree Road. Retrace steps 1 to 5 to return to Eltham Station. by leaving out the return ride to Diamond Creek described in steps 15 to 17 above and turning left onto the Diamond Creek Trail from Allendale Road immediately after crossing the railway line. by replacing steps 15 to 17 by Yarra Trail 1 (Diamond Creek to Heidelberg) to go to Heidelberg. Note that there are several places where Google does not recognise the bike trail, next to Railway Parade, next to Main Road and a loop at Maroondah Aqueduct and Allendale Road.